Valves are rhombic-elliptic, becoming elliptic in small valves, with broadly rounded ends. The axial area is narrow and linear. The central area is a distinctive “bow-tie” bordered by 5-8 irregularly shortened striae. Striae are curved and radiate throughout, and increase slightly in density toward the apices. The raphe is filiform, with straight proximal ends and distal ends deflected in opposite directions. Cavinula lapidosa is widespread throughout the United States and Europe (Cantonati et al. 2017), but typically occurs in low abundance. 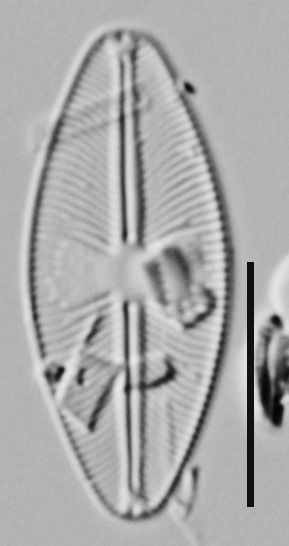 Cavinula lapidosa is reportedly indicative of low nitrogen conditions (Potapova and Charles 2008) and silica-rich waters (Szczepocka and Rakowska 2007). Navicula lapidosa Krasske, nov. spec. Fig. 7. Elliptisch bis stumpf rhomboid. Schmale lineare Längs-area, rechteckige Zentralarea, die fast bis an den Rand reicht, da die mittleren Streifen sehr verkürzt sind. Streifen 26 in 10 μ, strahlend, leicht gebogen, konvexe Seite den Schalenenden zu-gewandt. Länge 18 μ, Breite 8 μ.
Vorkommen: Nasse Granitwand am Bahneinschnitt am Milchhübel bei Oberputzkau (Lzb.). 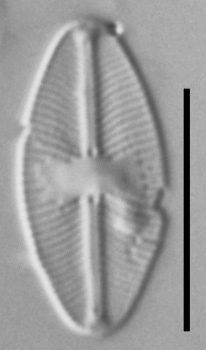 Lange-Bertalot, H. and Metzeltin, D. (1996) Indicators of oligotrophy - 800 taxa representative of three ecologically distinct lake types, Carbonate buffered - Oligodystrophic - Weakly buffered soft water. Lange-Bertalot, H. (ed. ), Iconographia Diatomologica. 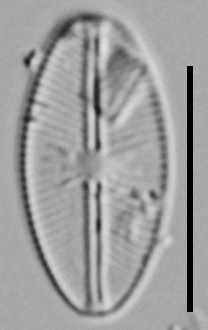 Annotated Diatom Micrographs. Vol. 2. Ecology, Diversity, Taxonomy. Koeltz Scientific Books. Königstein, Germany, 2:390 pp. 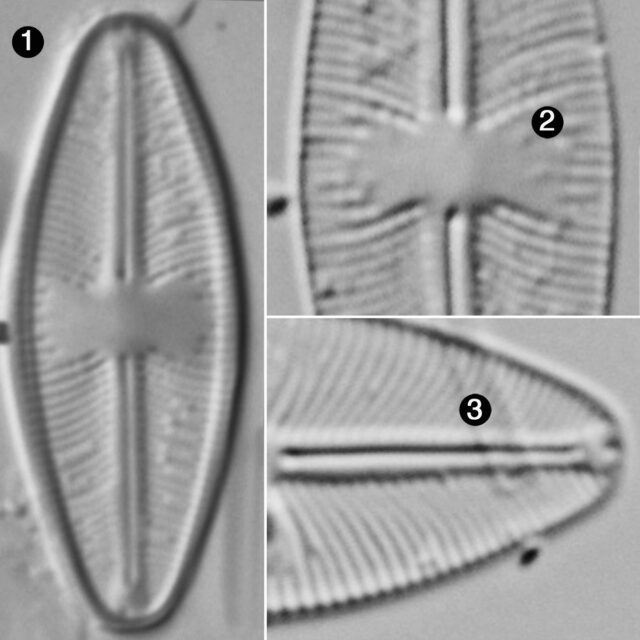 Lange-Bertalot, H., Hofmann, G., Werum, M. and Cantonati, M. (2017) Freshwater Benthic Diatoms of Central Europe: Over 800 Common Species Used in Ecological Assessment. English edition with updated taxonomy and added species. Koeltz Botanical Books, Schmitten-Oberreifenberg, 942 pp. Szczepocka, E. and Rakowska, B. (2007) Diatoms in the biological assessment of the ecological state of waters using the Czarna Staszowska River as an example Oceanological and Hydrobiological Studies 44.2: 254-266. Valves are rhombic-elliptic with broadly rounded ends and a bow-tie shaped central area. Striae are curved throughout the valve.